Temperature and humidity dial, humidity psychrometer, dew point meter, hygrometer thermometers, pocket sling psychrometers. Thermometers, hygrometers, and sling psychrometers are used to monitor environmental conditions and help control the process. For additional testing equipment, please see the Adhesion tester , Hardness tester , and Thickness gauges pages. Wall mount 4" diameter dial with a plastic face that meets food industry requirements. Weight is 3.7 ounces. Large, clear numerals are easily read from a distance. Uses a precise synthetic hair hygrometer with an accuracy of ±5%. 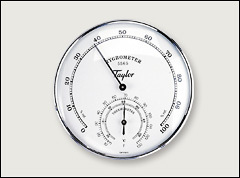 Inner dial shows temperature using a bimetal thermometer, with an accuracy of ±2°F. Relative humidity scale from 0 to 100%. Temperature scale from minus 30 to 130 degrees Fahrenheit. A certified model is also available: please call for pricing if you want the certified model that includes a N.I.S.T. traceable certificate of compliance. Pocket sling psychrometers are self-contained instruments that measure the humidity by comparing wet and dry bulb thermometers. The calculations are made with a sliding calculator on the plastic instrument case. Range: 20 to 120°F. Accuracy: ±1 scale division. 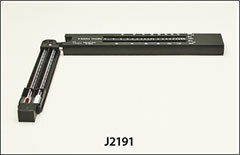 Overall length: 21 cm (8 1/4"). Measures the relative humidity, air temperature, and surface temperature. 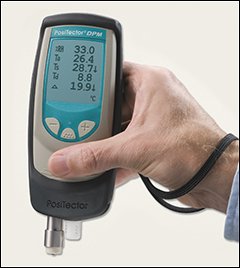 Calculates dew point temperature and difference between surface and dew point temperatures. Meter comes complete with humidity, air, and surface temperature sensors, protective rubber holster with belt clip and wrist strap, 3 AAA batteries, instruction sheets, nylon carrying case with shoulder strap, Certificate of Calibration traceable to NIST, and a two (2) year warranty on body and sensors. Made in USA. Durable rugged, outdoor/indoor instrument. Solvent, acid, oil, water and dust resistant; meets or exceeds IP5X. Scratch and solvent-resistant display suitable for harsh environments. See our Dew point meter specs pdf for more information.